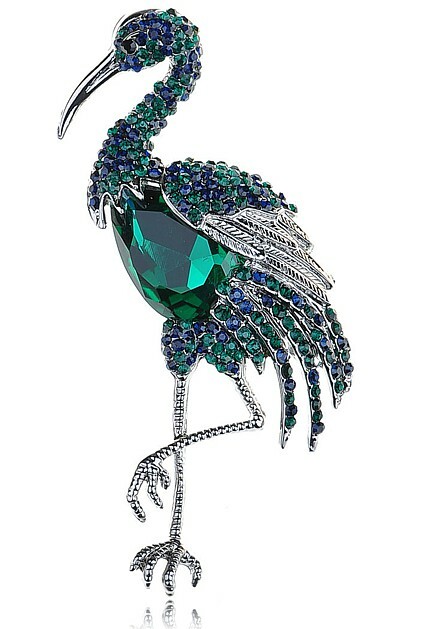 Esmeraldo, the Green Flamingo, has copied the look of her heroine, the famous Flamingo, featured in the Duchess of Windsor’s Jewellery Collection. Shown here in the iconic pose, standing high and mighty on one leg, she is looking forward to surveying the world from a lapel or pocket asap. This rather regal bird is captured here sporting her Sunday best Emerald Green and Capri Blue crystal coat, with her highly-defined, silvery feathered wings draped casually over her toned crystal torso. ! Size: 10 x 5cm (4” x 2”).